The latest innovations in the formulation and manufacture of polyurethanes (PU) for increased thermal performance and enhanced fire retardance will be unveiled at the triennial UTech Europe conference and exhibition. UTech Europe 2015 will take place in Maastricht, The Netherlands from April 14-16, featuring over 90 detailed technical papers delivered in a total of 11 sessions. The afternoon of Day Two of the conference (April 15) features a session of 11 papers dedicated to innovations in the use and manufacture of PU in rigid foams with speakers from Dow Polyurethanes, DuPont, Bayer MaterialScience, Momentive, Air Products, ICL-IP, Foam Supplies Inc, BASF, Honeywell and Lambiotte. Dow’s global technology leader Giuseppe Vairo will present an “Overview on Latest Fire Reaction Technologies for Polyurethanes in Construction”. 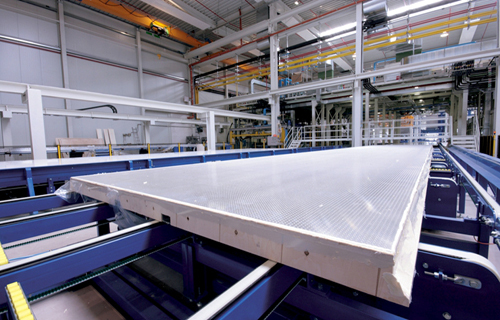 The company has developed in an innovative panel concept, providing produce Insulated Metal Panels (IMP) manufacturers with a step-change fire reaction performance that will allow a broader use of PU and Polyisocyanurate (PIR) cored panels to the highest fire safety standards. Marc Fricke of BASF will deliver a paper introducing the company’s SLENTITE – a new high performance insulation material for climate management applications. It is a novel type of organic aerogel based on PU chemistry. Aerogels are highly porous materials consisting of up to 90% in their volume of air-filled pores. The exceptional insulation performance is made possible by optimized pore size in the nano meter range. The new material is said to offer a 25-50% slimmer insulation compared to conventional products. David Williams, Director of Technology at Honeywell will cover “Energy and Environmental Benefits in the Cold Chain Sector Through the Adoption of High Performance LGWP Blowing Agent Solstice Liquid Blowing Agent”. Solstice LBA is being adopted by residential and commercial appliance manufacturers worldwide, including Whirlpool, Haier and Midea, and spray foam and panel construction insulation companies like LaPolla, Kingspan, and SoflanWiz, to reduce their environmental footprint and comply with environmental and energy efficiency regulations. Dow Polyurethanes will feature a halogen-free flame retardant VORATHERMTM CN 100 Series PIR technology for construction insulated metal panels that enables B-s1,d0 Top Euroclass fire reaction performance. Its PASCALTM PRO technology will also be on show and delivers a breakthrough in energy efficiency and productivity for the professional cold chain industry and cold storage panel manufacture. The company will also profile its VORAFORCETM systems for composites manufactured by pultrusion or filament winding and used in construction and infrastructure applications. ICL-IP is introducing a new reactive all phosphorus technology that incorporates fire resistance into the polymer matrix of rigid polyurethane thermal insulation materials. INVISTA will be showcasing innovations that include both TERATE HT polyols – a family of robust, high-performing aromatic polyester polyols for use in rigid insulation foam.